It’s 2:00 pm and you have 10 minutes before it’s time to pick up your children from school or take them to soccer practice. Ask yourself, what small task or chore can you accomplish? What about a quick cleaning task or 10-minute clean-up chore? Did you know if you do a few 10-minute chores each day, it’s easy to keep your home clean all week? Here are 15 ideas for how to keep your home keep in 10 minutes a day. Throughout your day, you probably find you have short blocks of 10 minutes (which is not long enough to start a big project, but just enough time to complete a small task). When you complete one or two of these small chores a day, you will feel better (because that chore is done) and your home will be a little cleaner every day. Getting the dishwasher loaded or unloaded will save you time after the next meal. If the dishwasher is empty, get all the dirty dishes loaded. The clutter of dirty dishes will be cleared from the counter. Or unload all the clean dishes so they will be ready to use for the next meal and the dishwasher will be ready to be loaded after dinner. Don’t you just hate it when you start washing dishes after dinner and open a dishwasher full of clean dishes, it’s one more step to finish the kitchen clean up. Do the prep when you have a few minutes early in the day so the dishwasher will be unloaded and ready to load after the next meal. No one likes to fold and put away laundry (at least not anyone I have met). Use the 10 minutes “in between” other activities to get the laundry put away. We might not like folding and putting away the laundry, but you want to be able to find your clothes when you need to wear them and you don’t want too much laundry to pile up and it always feels good to have this chore done! If your home is like ours, you probably have to sweep your floors a few times a week. When you have an extra 10 minutes, get this quick task done. Similar to sweeping, take a few minutes and do your weekly floor mopping. I don’t mean just wipe them down fast, take a few minutes and clear the clutter off the countertops, lift up the toaster and wipe away the breadcrumbs from the toaster. Do a thorough cleaning of your counters. Grab your cleaning supplies and do a complete bathroom cleaning. You can easily wipe down the countertops, scrub the toilet and wash the shower in 10 minutes. Get your feather duster and carefully dust your house. Take a few extra minutes to be sure you dust well. No “go around” jobs as my mom would call it, that meant you had to lift up everything when you dusted you couldn’t just “go around” each item. When you have 10-minutes, take a laundry basket (or similarly sized basket) and walk through your home quickly picking up items (shoes, toys, books, magazines, TV remotes, etc….) that are out of place. Put them in your basket. As you walk through each room, return the misplaced items to the correct place. If you have two story house, you can do one floor at a time. You might find it helpful to include a small basket at the top of the stairs or foot of stairs for items that need to be returned up or downstairs. Make it a house rule to empty the basket if you go up or down the stairs. Pull all the sheets off one bed and replace them with clean, fresh smelling sheets. Don’t you love the smell of clean sheets? I usually review and sort our mail every day, but if you let it pile up for a few days, take 10 minutes and decide which pieces of mail you need to act on (i.e. pay a bill) and which ones you need to file or throw out. Email gets out of control quickly. If you have 10 minutes, quickly review your email. Delete it if you don’t need it, respond or file it for later. You could also take 10 minutes and unsubscribe from all the emails and newsletters you no longer read or that clutter your inbox. When my email becomes overwhelming, I go through a start unsubscribing. You may not be able to vacuum your whole house in 10 minutes, but you can do areas that need a second vacuuming in the week. For example, I vacuum the whole house on Friday, but many times the high traffic areas that everyone walks through will need a quick second vacuum before the next week. Grab your vacuum and do a quick tidy up. You could also vacuum between the couch cushions or around the baseboards to get the crumbs you don’t usually get. My children always leave the blankets on the couch, the pillows scattered in the TV area. Take a few minutes and put everything back in the right place, and fold the blankets. Don’t forget to find the TV remotes and put them in their “place” so the next time someone wants to watch TV the remotes are easily found. I love to read. I have books I am reading everywhere. When I am not reading, I put my books in set places so they are not left all over the house and so I can find them when I am ready to read again. I also receive many magazine subscriptions. Magazines pile up quickly. They get left on the kitchen counter, on the table in the living where someone was reading one, and so many other places. Take 10 minutes and organize all your books in one place so you can find them when you want to read and get all your magazines back to one place (like a basket or magazine holder) to read later. Toss the old magazines you have already read or know you will not read (they just create clutter). Prepping dinner in advance will save you time later when your day is busier with kids and homework. I love to prep dinner ahead of time, because when it’s time to cook I can easily add all the items to the crockpot or start cooking quickly when it’s time. You could also make a meal plan for the week. Look through your pantry and freezer and plan your meals based on the food you already have. Or as you plan your meals make a list of grocery items you will need. Tip: shopping only once a week will save you time and money. The Smart Mom Home Cleaning Planner has 12 done-for-you cleaning checklists for every room in your home. It makes your home cleaning easy! Use these checklists as your guide for all the cleaning tasks in each room. Then go room-by-room and clean your home. You can use the checklists again and again. You also have space to make your own cleaning checklist for monthly and quarterly cleaning tasks. Save time cleaning and have more time for fun. Get your copy of the Smart Mom Home Cleaning Planner today. 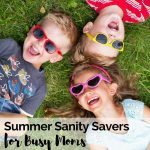 Some days are long and very busy or our children are extra cranky. On these days, if you have an extra 10 minutes, sit down and take a rest. Sometimes the best use of 10 minutes is to just give yourself a break. The next time you have 10 minutes, ask yourself what quick task or chore can I do right now that will save you time later. Or if you are tired and stressed, give yourself a rest. What home cleaning chores do you like to do when you just have an extra 10 minutes? Hope it’s okay to post twice. I also have a question: what if all of these desperately need done and you have… 15 min. How do you know which to go to? I would do the one task or tasks I thought most important. For example, the dishes need to be cleaned so we have clean plates and the laundry must be done so we have clean clothes. Sometimes “tidy-up” work that helps us feel like the house is clean can wait. Sorting mail and magazines can wait when needed. I remember when my kids were little, we just picked up the toys and put them in the toy bins. I didn’t worry much about sorting and organizing (they were going to be a mess again tomorrow). If you keep doing a few small tasks every day and rotate the tasks, you can keep your home mostly clean. Thanks for your response. I think I figured it out about the toys. Maybe one day I’ll get past a sort of maybe mostly-ish clean house. These are all fantastic ideas. It’s surprising how much we can get done every day just by doing a bit here and there! Hi Katie, you are right. We can do more than we think in just 15 minutes, we just need a plan. I think you’ve pretty much listed all of the homemaking tasks I might try to tackle in 15 minutes. I’m always surprised at how one quick little sweep will change the whole feel of a room. I’m trying to train myself to take care of a task right away if it’ll take less than a minute to do, instead of walking past it, as is my norm! Hi Julie, thanks for visiting. I like to unload the dishwasher in the morning too. It’s one of those simple tasks like making the bed that just make you feel like the day was started right. Ah! This is awesome! I have the hardest time thinking I need hours set aside to get things done but you’re totally right. These can all be done in 15 minutes. Especially cleaning the bathroom! It’s a chore that feels longer than it is, but if I set a timer I can do a deep clean of our bathroom in 15. Leah, for me it’s always doing a few quick tasks and chores that help me stay on top of all my cleaning. 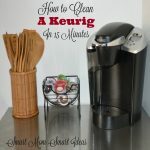 It’s much easier to think it will only take 15 minutes, rather than cleaning my whole house will take 3 hours! 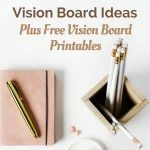 Great ideas and so many of them I’ve incorporated already – well I think all of them. I love using a timer for 15 minutes even on the hard tasks because I’ll see how much I can really do in 15 minutes. It’s a whole lot so I’ll set it again and again. Hi Debbie, a timer is a great idea to challenge yourself and stay focused for just 15 minutes. These are great! I featured you today on Women With Intention Wednesdays! 🙂 Thanks for linking up! Hi Jenny, Thanks for featuring the post. This is such an encouraging list. I probably have at least one time every day where I have 15 minutes for doing an “extra” task not on my list. I’ll have to remember that I could get a lot done in those 15 minutes. Hi Jennifer, you are right doing just one of these quick “15-minute” tasks each day can make your “cleaning day” or weekend so much easier because you finished one and it didn’t pile up. The one I do most frequently is put away the laundry. I really hate putting laundry away, but it’s just terrible if it piles up for a week. I’ll avoid putting away a basket of laundry for days! You mean I can solve that mess in just 15 minutes? 😉 This is a good reminder. And, yes, committing to meal planning every week saves so much time and energy, making me feel on top of things with a relatively small time investment. Laundry piles up so fast. But if you do just a little every day, it’s not so overwhelming. If there is a basket of clean laundry, I try to put it away before the end of the day. You inspire me to get organised. I think mopping the floors and bathrooms are not on my favourite to do list but if you do them regularly it should take less time. Thanks for some helpful advice. #WWIW link up. I don’t enjoy mopping or cleaning bathrooms either. I have set days of the week for these chores (but I do try to complete each one in 15 minutes or less). Gathering laundry from bedrooms and bathrooms and starting a load of laundry is something that I can get done in 15 minutes. Clothes never seem to make it to the hamper with toddlers and preschoolers so I always have to do a walk through when I need to start a load. Great list! I find even with older children I still pick up laundry and shoes too often. Getting the laundry started is a great 15 minute task.